This woman’s event sounds amazing! If you can make it, do so. Read how one woman made a list of dreams and has achieved 97 of her 101 aspirations! Ladies, it’s time to make a spring/summer bucket list. Boston, Mass. (April 19, 2017) Women throughout Greater Boston are invited to “taste test” over 50 different activities spanning 10 unique categories at the Westin Waterfront Hotel in Boston on Saturday, April 29, 2017. 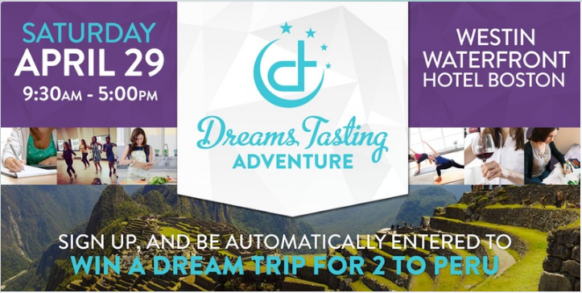 The Dreams Tasting Adventure will provide women the opportunity to participate in a wide variety of activities from dancing and mixology, to writing and business planning, to pursuing a dream to become a chef, sommelier, or yoga instructor — all with the goal of encouraging women to pursue their personal and professional dreams. Janet Kraus, CEO of Peach Co and former head of Harvard Business School’s Entrepreneurial Program, will give the keynote speech entitled the “ABC’s of Confidence.” Author Randy Susan Meyers, Morris Media’s (publisher of Where magazine) Regional Vice President of Sales Kristen Standish and MDK Brand Management Founder & Principal Denise Kaigler will give presentations on the main stage, and Fred Astaire Studios will give a performance. Launched by founder of DreamsCo, Marci Nault, the Dreams Tasting event is a revolutionary concept in the event industry designed to inspire women to break off from the norm of lectures and pamphlets, and instead create a personal and memorable experience. In 2008, Melrose resident Marci Nault had the realization that she was not living life the way she wanted to. She was inspired to make a list of dreams, resulting in 101 aspirations. Since making this list, she has achieved 97 of her dreams including becoming a published author with Simon and Schuster, a dance performer, a competitive figure skater and a solo female world traveler. Now, she is spreading her inspiration first-hand through the Dreams Tasting Adventure. Marci believes all women should make a spring/summer bucket-list filled with their dreams and change their lives. Tickets for the event are now available online at www.dreamstasting.eventbrite.com. Each ticket purchase comes with the chance to win a #BucketListTrip to Machu Picchu in Peru! More information about The Dreams Tasting Adventure can be found on Instagram (@dreamstasting), Twitter (@101Dreamslist) and Facebook (https://www.facebook.com/marci.nault). One Response to Women’s Event 4/29-Sounds Amazing!!!!! I’m all about achieving your dreams and this sounds fantastic . I wish I could go but have plans already for that day.